Some of music industry’s best artists collaborate to pay tribute to the phenomenal contribution of the iconic Filipino pop-rock band, The Eraserheads. 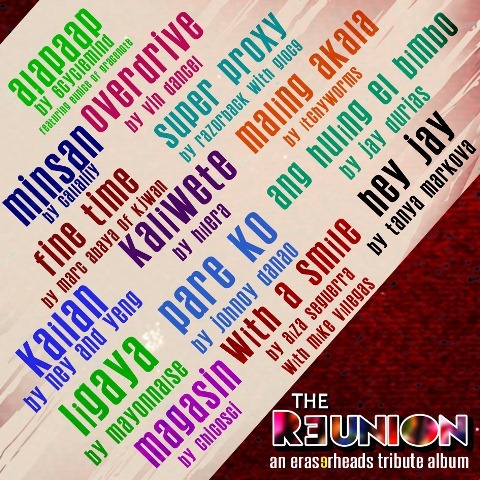 Released by Star Records and Star Cinema, “The Reunion: An Eraserheads Tribute Album” features 14 anthemic Eraserheads hit songs including ‘Alapaap’ by 6cyclemind with Eunice of Gracenote, ‘Minsan’ by Callalily, ‘Overdrive’ by Vin Dancel, ‘Fine Time’ by Marc Abaya of Kjwan, ‘Super Proxy’ of Razorback with Gloc9, ‘Kailan’ by Ney and Yeng Constantino, ‘Kaliwete’ by Hilera, ‘Maling Akala’ by Itchyworms, ‘Ligaya’ by Mayonnaise, ‘Pare Ko’ by Johnoy Danao, ‘Ang Huling El Bimbo’ by Jay Durias, ‘Magasin’ by Chicosci, ‘With A Smile’ by Aiza Seguerra with Mike Villegas, and ‘Hey Jay’ by Tanya Markova. “The Reunion: An Eraserheads Tribute Album” is available on record bars nationwide on Wednesday (May 9). See the artists photos HERE.